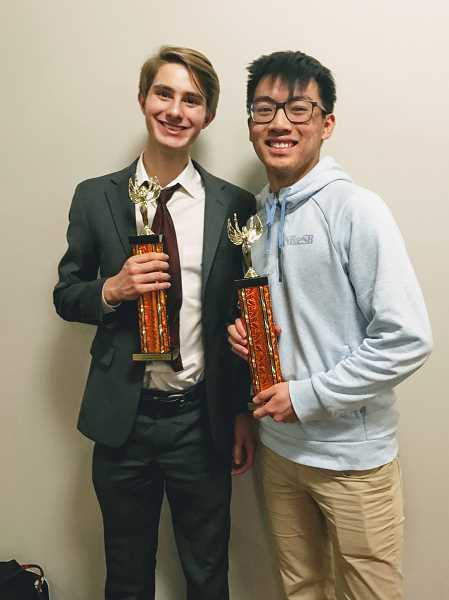 West Linn High School Debate Team members Haydn Maust and Dennis Tang make quite the pair. Though they can be quite different in style, the comradery and collaboration between the two inspires WLHS speech and debate advisor Amarou Yoder. The two compete in the debate style known as Lincoln-Douglas (L-D), one-on-one debates that require each person to present both sides of an argument. "What's been fascinating for me as a coach is that they just keep getting better and better and they work so well together and it is entirely their thing," Yoder said of Maust and Tang. "It's amazing to see young people do this. Not only are they really good at it but they work so well together." This teamwork has helped both of them find success on the debating stage this season. Maust, a junior, took second place at the Willamette University and Ridgefield tournaments, won Tournament Champion and First Speaker (he earned the most speaking points) at the Sprague Tournament and earned first speaker for the preliminary rounds at the Lewis and Clark tournament. Tang, a senior, earned second at the University of Puget Sound tournament and Alta Black and Silver tournament and first at Lewis and Clark. These placements have earned him a spot in the Tournament of Champions, a tournament for with only 60-90 qualifiers nationwide. He is currently the 42nd ranked L-D debater in the county. There are two types of L-D debates, Maust explained. Traditional debate and progressive (or circuit) debate. Tang and Maust both compete in each, though Maust prefers traditional and Tang progressive. "One is more traditional, in front of more parents, and so you need to be very persuasive, sound very clear, be very polite and respectful, seem like you're the nicest person on the entire planet," Tang said. "Haydn is very good at that type of debate. He's very clear. He comes into the round looking like someone you would trust and someone that is dependable." In circuit debate, "people talk a bit faster and arguments become very very technical. It's not about how well you sound. They don't care about eye-contact. I could show up in sweatpants and debate," Tang explained. Each debater's affinity for each type of debate is evident even in the way they dress, Tang said. He said that on debate weekends, people don't expect them to have come from the same event, with Maust wearing a suit and him more casual wear. Yoder, a first-year advisor for WLHS speech and debate, is even more impressed by the successes of Tang and Maust, given the fact that neither of them have been debating for very long. Maust began debating last year and Tang is in his third year. "Haydn has definitely improved a lot. The Willamette tournament (where Maust took second) is the biggest tournament in Oregon before the state tournament," Tang said of his teammate. "This is his second year of doing L-D and he's beating people who have done it for four years, so he's done a great job and improved a lot since last year." "I think I've done better this year than I was expecting probably because I've put in more time than I did last year," Maust said. "I've really tried to up my game when it comes to preparation and I think that that did pay off. There is also the element of starting to focus more on what I sound like." Tang's success is all the more impressive given the fact that he has achieved much of it without a proper coach or team. During his sophomore year, Tang was essentially his own coach, teaching himself and going to tournaments on his own. Things got better the next year, when Maust joined the team and the two began to help oneanother. "We've had a bunch of advisors, people who didn't know what they were doing, so we had to spend half the year teaching them how to sign up for tournaments, teaching them how to coach us, or they just weren't serious," Tang said. "We've had three different coaches in three years. That constant change makes it very difficult to have a solid group, but Ms. Yoder came in and she's doing a good job of trying to change our culture, and get people to be a lot more serious, have our club become more like a team." While Tang and Maust were quick to credit Yoder for saving the team, Yoder was just as quick to credit them. "The kids who form the core of this team, their commitment to the event throughout all the changes really speaks to their commitment to this activity," she said. "It's because of kids like Dennis and Haydn that there is any type of legacy for me to come into." Tang and Maust hope their successful streak this season will continue. Tang hopes to perform well and make his way into the top 32 at the Tournament of Champions. Maust hopes to do well at the state tournament and hopefully earn a spot in another national tournament.